Firstly, let the seller (or agent) know that you want to make an offer and, most importantly, insist that you wish to sign a contract. This lets the agent and the sellers know you are serious. The notary can be chosen by you the buyer and the fee charged by the notary is usually between 1% and 2.5% of the agreed selling price. The sales and purchase agreement is drawn up by the notary in Indonesian and in English or other language translation may be supplied but the Indonesian document is the legally binding one. If there is a selling agent who is the third party, then they will prepare a preliminary sales and purchase agreement to be signed by all parties. The preliminary agreement will be transferred into a binding sales and purchase agreement which is drawn up by the notary. Transfer the agreed deposit (usually 10 – 25%) to be held in the notary escrow account. Do not, under any circumstances pay the deposit to the seller (owner). Once a deposit has been received, the seller then has to agree to take the property off the market. After a buyer and seller have generally agreed upon the price and all other terms and conditions for a property transaction, the parties usually sign a preliminary agreement, a Binding Sale and Purchase Agreement or a Binding Leasehold Right Agreement (Perjanjian Pengikatan Jual Beli or Perjanjian Pengikatan Sewa Menyewa) to formally agree and reflect the conditions of the proposed transaction. We recommend that a buyer or seller engage an independent legal counsel in order to ensure their agreed terms and conditions are properly reflected in the Binding Sale and Purchase Agreement or Binding Leasehold Acquisition Agreement respectively. Following execution of a binding agreement, the buyer would, through a legal representative or notary, conduct due diligence on the property. Note: It is recommended that satisfactory due diligence should be stipulated as condition for completion of the transaction under the binding agreement. In order to formally conclude the acquisition of the property as contemplated under the binding agreement, the parties would subsequently enter into notarial documents reflecting the acquisition of the property either in the form of a Sale and Purchase Deed (Akta Perjanjian Jual Beli or AJB) or in the form of a Leasehold Deed (Akta Sewa Menyewa), as the case may be. Until full payment of the agreed selling price is made and any other conditions for completion are met, the notary would hold the land certificates or deeds relating to the property transaction in escrow. 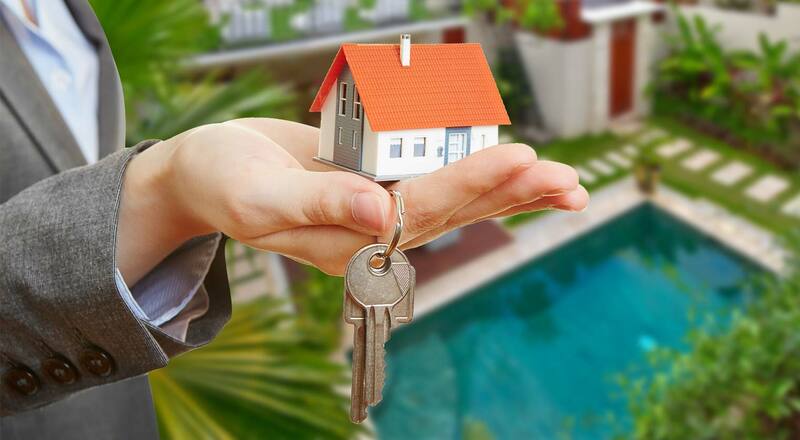 Once the seller has received full payment and all taxes accruing from the transaction have been paid, the title of the property is transferred and copies of the deeds released to the respective parties. In the case of a formal transfer of title over a land plot, i.e. Hak Milik, Hak Pakai or HGB title, the transfer will be effectuated and concluded upon the issuance of the land certificate by the competent land office reflecting the name of the buyer on the certificate. For Leasehold Right (Hak Sewa) acquisitions, there is no formal registration at the land office and only the respective lease deed copies will be circulated to the parties. The Notary executes a Deed of Grant of Hak Pakai (Akta Pemberian Hak Pakai atas Hak Milik) between the Hak Milik owner/designee and the foreigner pursuant to which the Hak Milik owner grants the Hak Pakai title to the foreigner. By separate Notarial Deed, the Hak Pakai owner may also prepay to the Hak Milik owner a number of agreed twenty-five year renewals. As we are not qualified legal advisers, we can only provide a general guideline as to how the process is done. 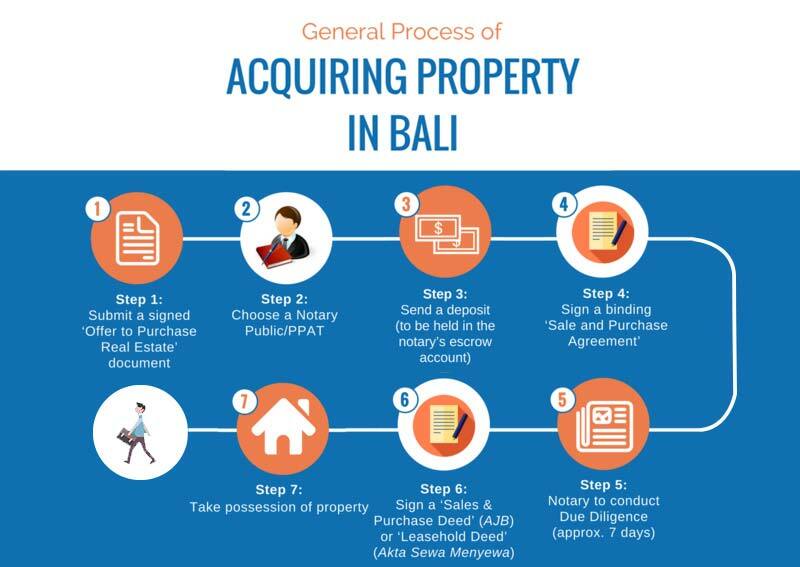 For those wanting full legal advice regarding the process of acquiring property in Bali, one needs to get qualified legal advice.